Fats Domino recorded his first Top 40 hit in December of 1949. Some consider his hit, “The Fat Man,” to be the first Rock and Roll recording. Over the years, Fats sold over 65 million records; a number surpassed only by Elvis for the 50’s era. 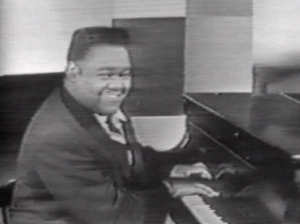 Fats Domino singing “Blueberry Hill” on the “Alan Freed Show” 1956. His records scored in the Top 10 of the pop charts ten times during the fifties, and he went on to reach the Top 40 Pop Chart 37 times in his career. And that was only Pop. Add in his R&B charted songs and Fats Domino hit the Top 100 an amazing 84 times. His signature song and my favorite, Blueberry Hill hit #2 on the Pop Chart and #1 on R&B in 1956. It wasn’t a new song. Blueberry hill started out a Swing tune recorded by Sammy Kaye in the 40’s, and later covered by Louis Armstrong. Fats added his special juice, a bit of Creole influence, and his special back beat and made it a classic. And we’re still singing along to his other hits: Ain’t That a Shame, Blue Monday, I’m Walkin’, Walking to New Orleans, I’m In Love Again, and much more. Fats Domino co-wrote many of his hits with his longtime friend Dave Bartholomew who also served as his producer. Dave Bartholomew was inducted into the Rock and Roll Hall of Fame in 1991. Their creations often used what they called “The Big Beat”. It was a combination of Domino’s boogie woogie style and a strong backbeat. Add in a bit of Domino flair, and it was Rock. With his success, it’s not surprising that there were a lot of awards and recognition along the way. Major awards include the Grammy Lifetime Achievement Award in 1987 and The National Medal of the Arts awarded by Bill Clinton in 1998. 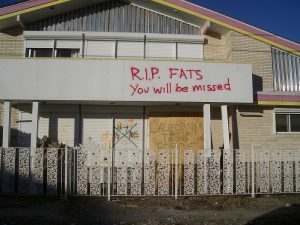 In 2005, Fats was presumed lost in Hurricane Katrina. His New Orleans home was found heavily damaged and empty. He had stayed behind to care for his ill wife. 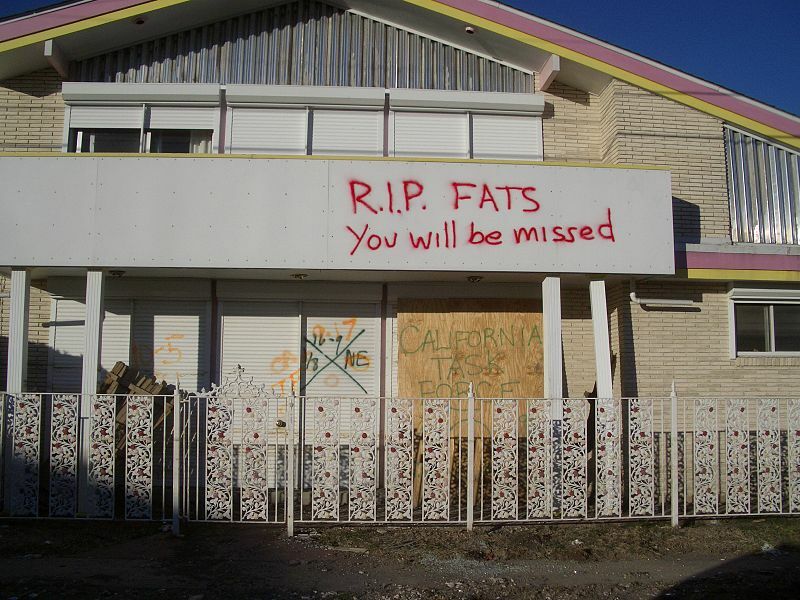 “RIP Fats. You will be missed” was spray painted on the house. It wasn’t until several days later that he was found safe after being evacuated. Fats Domino was one of the charter inductees into The Rock and Roll Hall of Fame when Billy Joel presented him as part of the first group of inductees in 1986.